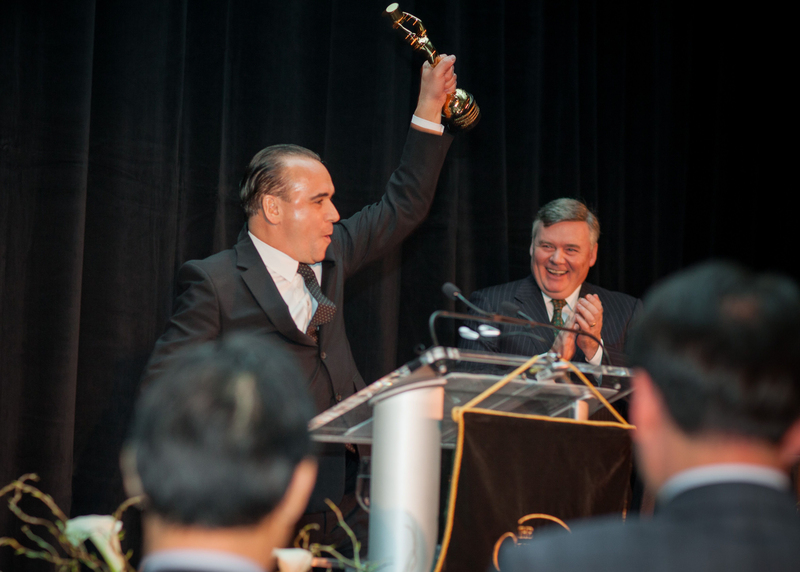 Honored for his dedication to professional excellence and innovation: Jean-Georges Vongerichten, chef/owner of Jean-Georges Restaurants. 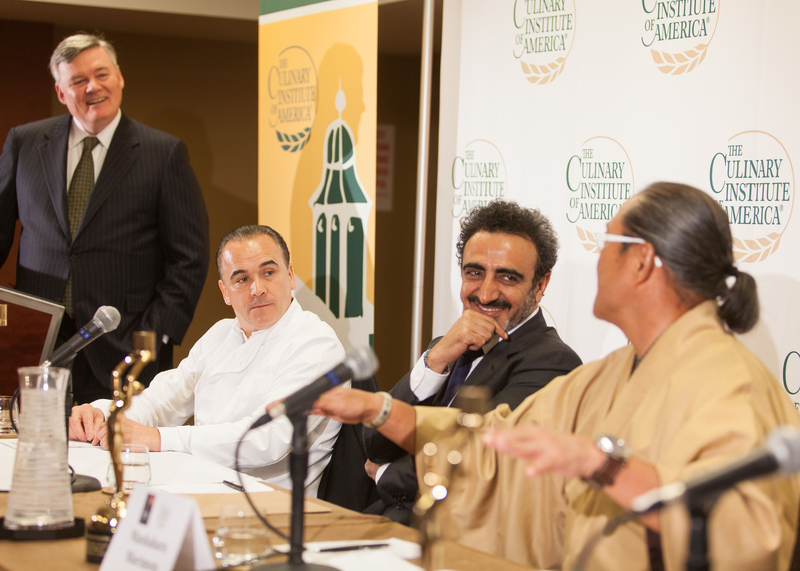 Honored for creating a product that promotes health and wellness along with philanthropic dedication in that area: Hamdi Ulukaya, founder and CEO of Chobani, Inc.
Honored for his contribution to the understanding of world cuisines and cultures: Masaharu Morimoto, chef/owner of Morimoto Restaurants. 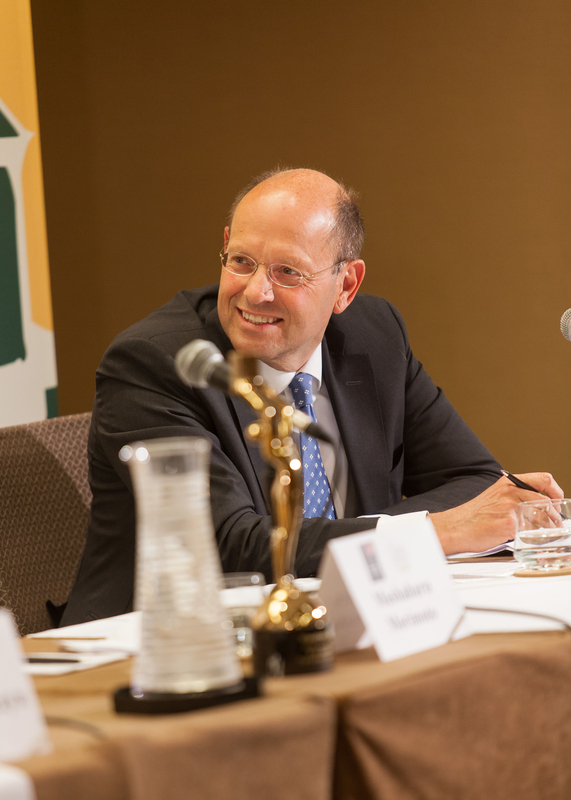 Honored for his and his company's commitment to sustainability and food ethics: Leo Oosterveer, CEO of Unilever Food Solutions. 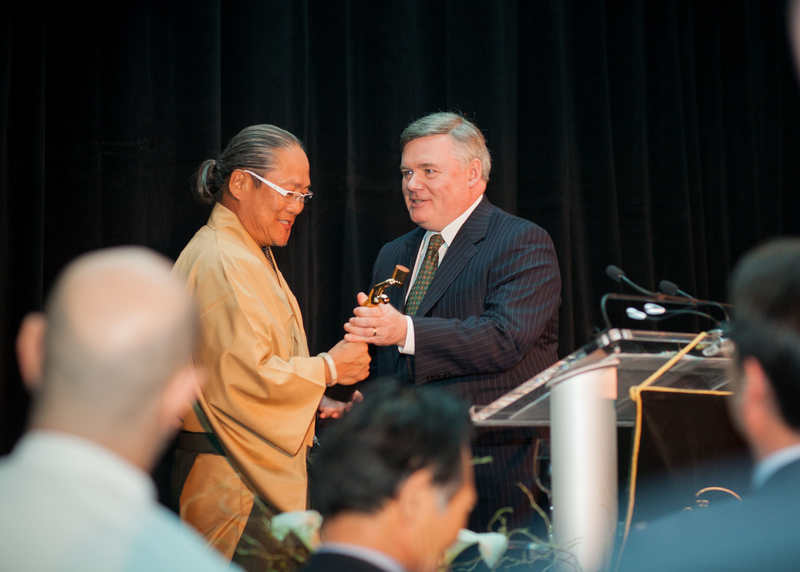 The 2014 awards took place at the Grand Hyatt in New York City, where the ballroom was filled with 500 attendees—including CIA graduates Charlie Palmer, Steve Ells, David Burke, and others. The Power of Food was explored through videos of the honorees and CIA students, and a presentation from CIA President Dr. Tim Ryan, who highlighted the contributions of the college. In his opening remarks, Dr. Ryan pointed out that students come to the CIA to be surrounded by people who have the same passion they do—a passion for food. 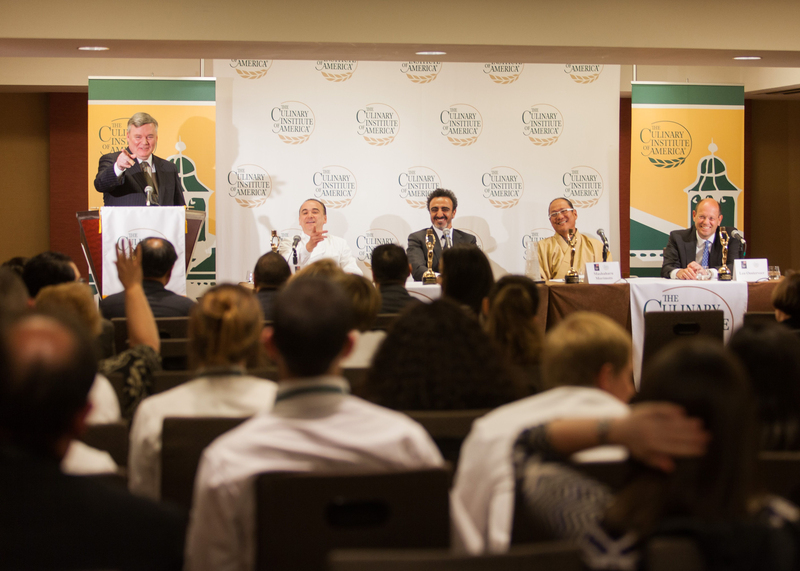 "All of us in the CIA family not only share this incredible passion," said Dr. Ryan, "but also a strong desire to turn that passion into something meaningful, something that will make a difference in the world." Dr. Ryan reminded the audience about the CIA legacy, "From the time we opened our doors in 1946 to welcome a class of 16 GIs in New Haven, CT, to our present-day status as the world's premier culinary college, the CIA has always opened students' minds to the possibilities beyond the kitchen and table." Jean-Georges Vongerichten: "Follow your cravings; follow your passion; follow your moods. Develop your creativity through these, and you'll find your style, your unique place in the culinary world." Hamdi Ulukaya: "Seek perfection. Whether in the way you cut vegetables or create recipes. Chefs who do that make amazing discoveries along the way." Masahura Morimoto: "Never limit yourself. Try everything to discover what your foundation is. Then build on that to create your personal style." Leo Oosterveer: "It's good to dream about your future, but you must also face reality and see what needs to be done in the world. Find a way to contribute to society, and you'll find success." A silent online auction, also in support of the scholarship fund, was hosted by ibidmobile. Guests had nearly 100 lots to bid on—trips, concert tickets, special events, private dining experiences, sports equipment, and more. In the end, with auction results, ticket sales, and contributions from the CIA's generous sponsors, the 2014 Leadership Awards raised $500,000 for student scholarships. Amy Zarichnak of West Hickory, PA, who will graduate with an Associate Degree in Culinary Arts in July, was one of the students who volunteered to help. "Everyone comes from different circumstances," said Amy, who is also the editor of the student newspaper, La Papillote. "This event is invaluable. Scholarships are appreciated in ways that cannot be measured. Only with this assistance are so many of us able to follow our dreams, be immersed in the world that we are passionate about, and realize the power of food."